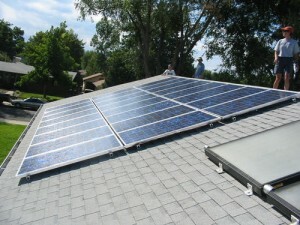 Tag Archive | "mono panels"
What is your opinion on the best solar panels? This is one of those subjects that we could talk about for days, months, years. Every salesperson from every solar company always says they know everything about all the solar panels, and the one’s they are promoting are the best. I simply don’t buy it. What seems to be the reality most of the time, is solar panels are basically very very similar in terms of the output they give in kilo watt hours. Of course solar panels have all different types of dimensions, colors, warranties, this and thats… but lets face it, we would need 7 or eight people’s fingers to count the number of solar panel manufacturers over in China who are making nearly all of the panels. From my experience, people who are wanting to put solar panels on their house are very concerned with “which panels” are the best. And most of the time, I would say a salesperson is going to tell you theirs and rattle off a long laundry list of reasons why. But in the end, the next salesman is going to do the same talk with the panels that their company happens to purchase from their distributor. My advice would be this, figure out which panels have a good warranty, ask the local installer about some references(VERY IMPORTANT), and then decide which panels match your personal taste as far as looks. The output is going to be very very close to nearly all other panels. In fact, some panels have names of two different companies when in fact they are made in the exact same building over there in good old China. Funny how that happens. I am hoping this will spark some great comments, since this is a question that everyone asks when putting on solar panels. Come on, there was no “Which Solar Panels are the Best for your Home or Business” class in high school was there?